A JCU medical student has added to his growing list of accolades after being invited to make a presentation at an international rural health conference. 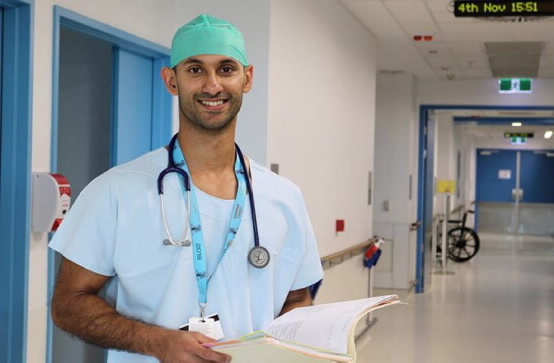 Jerry Abraham (pictured above), who is based at the Mackay Base Hospital, was awarded the national Rural Medical Student of the Year last year, in a rare coup for a regional medical graduate. Last month, Mr Abraham was invited to speak at the 12th WONCA World Rural Health Conference that was held in Gramado, Rio del Sur, Brazil. This was in his capacity as a health student and the Co-Chair of the National Rural Health Students' Network (NRHSN) in Australia. Mr Abraham said the title of his talk was National Rural Health Students' Network: A multi-disciplinary approach to rural health. “I talked about who the NRHSN is and the activities that we do in raising the profile of rural health,” he said. “I spoke about the need for a multi-disciplinary approach to holistic health, advocacy for health students, and strategies that will hopefully address the rural health workforce shortage in Australia. The NRHSN is is the only student body in Australia that collectively represents medical, nursing and allied health disciplines. It has more than 9,000 members who belong to 28 university rural health clubs throughout the nation. The NRHSN is funded by the Federal Department of Health and is managed by Rural Health Workforce Australia, the peak body for the state and territory rural workforce agencies. It aims to provide a voice for students who are interested in improving health outcomes for rural and remote Australians and to promote rural health careers to students and encourage students who are interested in practicing in rural health care. Mr Abraham, who was born and raised in Dubai, but is now an Australian citizen, said it was an honour to be the first JCU student to be elected as the Co-Chair of the NRHSN. “It's nice to know that us northerners are now considered just as good as our southern counterparts,” he joked. Prior to his medical studies, Mr Abraham completed a Bachelor of Engineering (Hons) overseas and moved to Australia in order to complete his Master of Telecommunication Engineering, at the University of Melbourne. He also achieved a Graduate Diploma of Education and a Master of Education before starting his medical studies. Mr Abraham said it was an honour and privilege to present at an international conference. “It was great to share what we have been doing in Australia through the NRHSN to address rural and remote health issues as most of the other representatives had similar concerns. Mr Abraham said he was hoping to become a rural surgeon “if all things work out to plan”. Mr Abraham said four Queensland organisations had been instrumental in helping cover his flight fares and living expenses for his trip to Brazil: Lee and Maree from Marlee Constructions Moranbah, Moranbah Medical Centre, Dr Reyno Niewoudt and Laura Terry and the Mackay Christian Family Church.